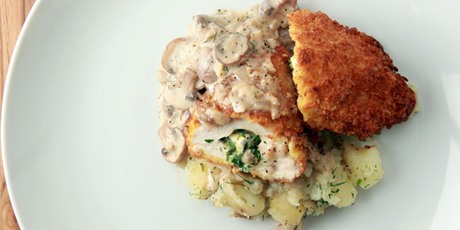 Enticing Chicken Kiev meets smashed new potatoes meets delicious! The following recipe was provided by a competitor from Food Network's Family Cook Off. This recipe has not been tested. If you have made this recipe, make a comment or rate it now. 1. Preheat oven to 400 F and preheat cooking oil in frying pan to 325 F.
2. Place a chicken breast on a cutting board. Use a paring knife to cut a pocket inside the chicken breast. 3. In a bowl add the softened butter, cream cheese, one egg white, 2 tablespoons of the panko, minced tarragon, thyme and parsley. Mix together and transfer to a piping bag. 4. In a clean bowl place the flour, salt and pepper. 5. In a second bowl, beat the egg. 6. In a third bowl, mix together the Parmesan cheese and remaining panko. 7. Place a chicken breast on a cutting board. Use a paring knife to cut a pocket inside the chicken breast. 8. Use the piping bag to fill the chicken with the cheese herb stuffing. Dredge each filled chicken breast in flour, then the beaten egg and then finally the bread crumb coating. 9. Fry in the preheated oil for a few minutes on each side to brown. Once browned on both sides, put the pan in the oven to finish cooking. Internal cooking temperature should come to 160 degrees Fahrenheit. 10. Let chicken rest for five minutes. 11. Cut each breast in half on the diagonal, serve with smashed potatoes and cover with mushroom cream sauce. Garnish with two pieces of dill per serving. 1. Melt the butter and add the diced onions and garlic. Stir to coat and add the sliced mushrooms. Cook at a medium to high heat until the mushrooms are soft and starting to brown. Be careful to not brown the onions or burn the garlic. 2. Add the flour and stir until mixed through. Add the wine and deglaze the pan. Stir in the cream and check for seasoning. Add salt or pepper as needed. 1. Boil the potatoes in salted water for approximately 15 minutes. 2. Drain and add the butter and herbs. 3. Place the lid on the potatoes and while holding the lid firmly in place, smash the potatoes inside the pot by vigorously shaking the pot. 4. Once done, stir the potatoes to thoroughly coat and check if all of the potatoes are broken. Check for seasoning.